This page is about the biblical person Joshua. For the book, see Book of Joshua. Joshua or Yehoshúa (יְהוֹשֻׁעַ—"The Lord is help") is a biblical character, whose life is described in the books of Exodus, Numbers, Deuteronomy, and especially the Book of Joshua. His dates are uncertain, having lived sometime between the eighteenth century B.C.E. and the late thirteenth century B.C.E., most probably the latter. He was Moses' personal aide and military captain, accompanying him when he ascended Mount Sinai to receive the Ten Commandments (Exod. 32:17) and attending the sacred Tent of Meeting prior to the establishment of the Tabernacle. He was also one of the 12 spies who were sent out by Moses to explore the land of Canaan (Num. 13:16, 17), after which only Joshua and Caleb gave a positive report for victory. Before Moses died, he appointed Joshua as his successor. Joshua became a prophet in his own right and led the Israelites victoriously into Canaan. He was absolutely ruthless in battle, believing that God had commanded the slaughter of every man, woman, and child of the Canaanite population centers. He also established several important religious shrines and apportioned tribal areas for settlement. The historicity of the account of Joshua's life is challenged by modern scholarship, as is the ethical attitude of the supposed Israelite conquest. However, he remains for many an inspiring example of faithful, courageous, and victorious obedience to God. Joshua was the son of Nun, of the tribe of Ephraim. The Hebrew pronunciation of his name would normally be Yehoshēa, and in three places he is called Hoshēa. In Greek he is called Ιησούς (Iēsoûs), the same as the name as Jesus of Nazareth and others bearing the Hebrew name Yēshua. Joshua first appears in the biblical narrative as a young man in Exodus 17, when Moses appoints him to lead a battle against the Amalekites at Rephidim. While Joshua commands the fighting forces, Moses stands atop a nearby mountain assisted by Aaron and Hur. The battle goes the Amalekites' way whenever Moses lowers his hands, but the fighting goes Joshua's way when when Moses' hands remain uplifted. In the end, "Joshua overcame the Amalekite army with the sword." Joshua alone accompanies Moses when the great prophet is called by God to ascend Mount Sinai to receive the Ten Commandments. Here he is identified as Moses' "aide" (Exod. 24:13). They remain on the mountain 40 days. Joshua is the first to hear a commotion in the camp as they descend, believing it to be the sound of a battle; but Moses recognizes it as an idolatrous festival centering on the Golden Calf. Exodus 33 states that Joshua also attends the "Tent of Meeting," erected before the construction of the more formal Tabernacle, where Moses would speak to God "face to face." Joshua remains inside the tent when Moses leaves it to return to the camp. Later, when God expands the gift of prophecy to include 70 elders at the tent, Joshua is also present. Hearing a report that two additional elders had received the prophetic gift without being present at the tent, Joshua objects, saying, "Moses, my lord, stop them!" Moses, however, responds: "I wish that all the Lord's people were prophets and that the Lord would put his Spirit on them!" (Num. 11:24-29). Joshua's faithfulness is demonstrated particularly in his role in the episode of spying in Canaan. Here (Numbers 13) his name is initially given as "Hoshea son of Nun." The spies are sent up through the Negev Desert into the hill country of Canaan. The spies return, all agreeing that the land is a good one, "flowing with milk and honey," but also reporting that its towns are well fortified and that some of the area is inhabited by the giant Anakites, descendants of the legendary Nephilim (Gen. 6:4). Only Joshua and Caleb testify in favor of attempting to conquer the land, saying "Do not be afraid of the people of the land, because we will swallow them up. Their protection is gone, but the Lord is with us. Do not be afraid of them" (Num. 14:19). The assembly, however, sides with the faithless spies and attempts to stone Joshua and Caleb. Moses intervenes on their behalf, prophesying that all of the Israelites born in Egypt except Joshua and Caleb will die before entering Canaan. Moreover, for every day of spying, the Israelites would have to spend a year wandering in the wilderness, a total of 40 years in all. The other ten spies soon meet their deaths in a plague. Near the end of the 40 years in the wilderness, God instructs Moses to appoint Joshua as his successor (Num. 27). With Aaron already deceased, the ceremony, involving the laying on of hands, is conducted by Eleazar, Aaron's son and new high priest. The Book of Deuteronomy adds Moses' words of encouragement to his successor: "Be strong and courageous, for you must go with this people into the land that the Lord swore to their forefathers to give them, and you must divide it among them as their inheritance" (Deut. 31:7). Moses continues to lead the Israelites into the country east of the Jordan River, where they win several military victories. Moses appoints Joshua and Caleb to begin the apportionment of tribal lands in Canaan. He then ascends Mount Nebo in the territory of Moab, sees the "promised land" for himself, and dies. Joshua emerges fully at this point as his successor: "Now Joshua son of Nun, was filled with the spirit of wisdom because Moses had laid his hands on him. So the Israelites listened to him and did what the Lord had commanded Moses" (Deut. 34:9). The people encamp at Shittim when Joshua assumes the command before crossing the Jordan River. According to the Book of Joshua, God encourages him to be strong and to cling to the Law, which was never to "depart out of his mouth." This includes an admonition to engage in holy war, burning those cities captured and leaving no enemy alive. After enlisting the cooperation of the kindred east Jordanic tribes of Gad and Reuben, his first concern was to spy out Jericho. His agents receive crucial aid in this task from a local harlot named Rahab. On receiving their report, Joshua instructs the Israelites to cross the Jordan. With the Ark of the Covenant carried by the priests in the van, the river miraculously divides, enabling the people to cross on dry land. In memory of this occurrence Joshua erects a monument of 12 standing stones. Here, at Gilgal, Joshua pitches his camp and remains for some time. In order that all might be able to participate in the Passover, he directs that every Hebrew male that had been born in the desert should be circumcised. Nearing Jericho, Joshua encounters a mysterious "man" who identifies himself as the "commander of the army of the Lord" and Joshua prostrates himself before him in worship (Josh. 5). Now begin the wars of conquest which Joshua carried on for many years, the record of which is in the Book of Joshua. 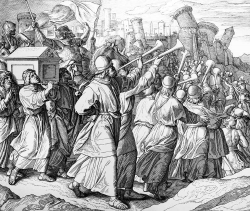 Joshua besieges the city of Jericho, finally capturing it. According to the Book of Joshua the men of war circle the city for six days in silence, and on the seventh day, seven priests circle it seven times, each blowing a shofar or ram's horn. Finally and all the Israelites shout as one, and the walls of Jericho fall. A curse is pronounced over the ruins, and every man, woman, and child in the city is killed except Rahab and her family. Joshua becomes famous by this victory, but meets a surprising reverse at Ai. God has removed his support of the war in consequence of the sin a man named Achan, who had not honored the curse against Jericho but has selfishly taken and hidden plunder. Achan, his wife, and even his sons and daughters are stoned to death for this sin, and Joshua promptly makes himself master of both Ai and Bethel. Hearing of the absolute slaughter of any settlements that resist Joshua's advance, the Gibeonites make peace with him, by means of a clever ruse. After this, on the Mount Ebal, Joshua establishes a sacred altar and causes the blessings and the curses of the Law of Moses to be read from Ebal and Gerizim in an act of renewing the people's covenant with God. 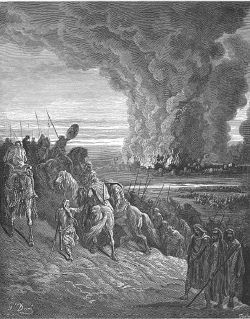 While Joshua is engaged in the north, five of the southern Canaanite rulers join to punish Gibeon for its collaboration with the Israelites; but they soon are routed at Makkedah by Joshua. During this battle a furious hailstorm sets in, proving more deadly than the sword. On this occasion also, at Joshua's command, the sun stands still in Gibeon and the moon in the valley of Ajalon. The fugitive five kings are discovered hiding in a cave. By Joshua's orders the cave is closed with huge stones until the battle ends. The kings are then thoroughly humiliated and slain, their bodies being hanged on trees until the evening, when they are taken down and cast into the cave. Then follows the conquest of Libnah, Lachish, Eglon, Hebron, and Debir. In the south, Joshua penetrates as far as Kadesh-barnea; in the west as far as Gaza. 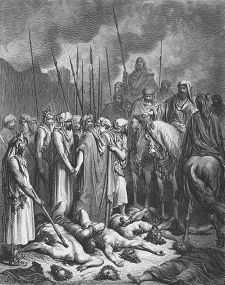 Later on he routes the allied kings of the north at Lake Merom—Hazor being the head of these kingdoms— killing the inhabitants and burning the city of Hazor. In this manner Joshua within a few years makes himself master of virtually the whole country with the exception of the Philistine and Phoenician coasts. He maintains a fortified camp in Gilgal and from there he governs the land, and there he began to allot the districts to the various tribes. The Judah, Ephraim, and half of Manasseh are the first to be settled, Caleb being allowed to take Hebron. After this, Joshua removes the Tabernacle and the Ark of the Covenant from Gilgal to Shiloh, and takes up his residence there. He continues the work of apportioning the rest of the land by lot according to the families. Cities of refuge, in which men who had accidentally killed another person can escape the blood vengeance of their victims' relatives, are also appointed. 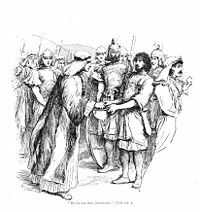 Joshua himself receives the city of Timnath-serah in Ephraim for an inheritance. Having thus completed his task, he gives Reuben, Gad, and half of Manasseh permission to return to their east Jordanic territory. 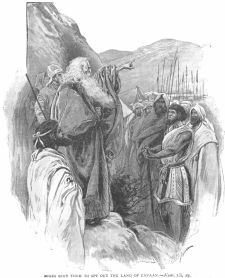 When he is "old and stricken in age" Joshua convenes the elders and chiefs of the Israelites and exhorts them to have no fellowship with the native population. At a general assembly of the clans at Shechem he takes leave of the people, admonishing them to be loyal to their God, who had been so mightily manifested in the midst of them. As a witness of their promise to serve God, Joshua sets up a great stone under an oak by the sanctuary of God. Soon afterward he dies, at the age of 110, and is buried in Timnath-serah. Joshua is regarded by the ancient rabbis as the type of the faithful, humble, deserving, wise man. He was always at the front of the army, not at the rear. 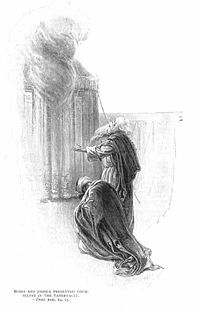 Some rabbis believe that the harlot Rahab became Joshua's wife. They had daughters but no son, but their descendants included many prophets. One opinion holds that Hannah, the mother of Samuel, was Rahab's reincarnation. Joshua's treatment differs somewhat according to the sources. In the Book of Numbers, he is commissioned as Moses' successor by Eleazer, the high priest, while in Deuteronomy, he is commissioned directly by Moses and God. The biblical authors generally take pains to make him more than merely a military leader, emphasizing his devotion to God, adherence to the Law of Moses, and absolute opposition to compromise with the Canaanites. While the Book of Joshua portrays a near complete conquest of Canaan under Joshua's leadership, the Book of Judges shows that the conquest of the land was not a concerted movement of the nation under one leader. Moreover, the data concerning the occupation of the various districts by the tribes present so many variants that most scholars have abandoned it as unhistorical. Archaeological evidence casts further doubt on the historicity of the conquest. Although there is indeed evidence of warfare in the period in question, it does not occur within the narrow time frame implied by the Book of Joshua—40 years. Moreover, Canaanite culture seems to predominate long after the supposed conquest by Israelites. Many scholars now believe that the Israelite emerged for the most part out of Canaanite culture and only gradually took on a distinct identity. This distinction was strongly emphasized by later biblical writers, who promulgated the story of the Exodus and conquest to promote their campaign of strict monotheism and absolute separation from Canaanite culture. Joshua's historicity has been doubted by critics, who regard him either as a mythological figure or as the personification of tribal reminiscences crystallized around a semi-mythical hero. The discovery of the Amarna letters casts an interesting light on both the figure of Joshua and the conquest. These documents contain several references to a group of nomadic warriors called the Habiru, who occasionally attacked Canaanite cities or hired themselves as mercenaries to warring kings. Contemporary Israeli archaeologist Israel Finkelstein theorizes that both Joshua and David may in fact been Habiru leaders, David being the last and greatest of them. According to Finkelstein, Joshua's story was later taken up and embellished by the priestly supporters of King Josiah in the late seventh century B.C.E. Their aim was to promote the earlier hero as a champion of the absolute monotheistic policy represented by Josiah's reforms and a model for the program of military expansion that Josiah pursued. There may have been many heroic stories in circulation regarding the ancient Habiru leaders, and in Finkelstein's view it is no accident that Joshua—whose name so closely resembles Josiah's—was chosen as an amalgam of these ancient warriors. In the end, Josiah rode forth with faith and courage, like a latter day Joshua, to do battle against Pharaoh Neccho II at Megiddo, and was slain in battle. It was an ignominious end for a king declared by the Bible to be the most righteous ruler since David, and whose supporters had hoped would be as invincible as Joshua himself was supposed to be. ↑ Deuteronomy does not mention Eleazar's role in consecrating Joshua. ↑ The punishment does not conform with the Book of Deuteronomy's stipulation that children must not die for the sins of their fathers. This is one of many factors leading scholars to believe that the Deuteronomic code is relatively late in origin. ↑ The Samaritans would later claim Gerizim as the only authorized Israelite shrine, rejecting the Temple of Jerusalem as the work of impostor priests. ↑ The Book of Judges, however, makes it clear that much of the land, including important cities such as Jerusalem and substantial areas still under the control of local tribes, had in fact not been conquered in Joshua's day. Some text based on Easton's Bible Dictionary (1897) and the Jewish Encyclopedia (1906). This page was last modified on 16 January 2019, at 20:45.